Pinning your hopes on a new social media product? One of my mantras is that “Social Networking is permanent, Social Media is fashion”. Regularly new social media platforms emerge and get publicity and some of them gain momentum. MySpace, Friends Reunited, and Bebo had their time in the spotlight and were superseded by Facebook and Twitter as the dominant platforms. This year has marked the rise of Pinterest and Instagram. In the Social Media B2B world you can’t afford to ignore anything – any strategy based on any one platform or anything anchored to just Facebook and Twitter is bound to founder sooner or later. You need to keep monitoring the blogs, checking the statistics and talking to customers to understand what’s hot. Trying to make sense of what is happening is more challenging. Is the growth of Pinterest based on new social media users who have found the platform they like, switchers from Facebook and/or Twitter, or does it serve a need which isn’t being addressed elsewhere so that it is a true addition to the social media? It’s too early to tell in my opinion and the best practise is to wade in and try to understand what Pinterest is about. As with most Social Media platforms the concept is really simple and the applications are really easy to use. The big question is always Why? What is it that drives people to move beyond just registering an account and into becoming a daily user and contributor – a content provider rather than a lurker? The figures speak for themselves. Development started at the end of 2009 and in 2010 the first users were invited to use the controlled beta version. By the end of 2010 there were 10,000 users. The site really took off during 2011 with the launch of an iPhone app so that by the end of the year there were 11 million visits a week and the site was listed as one of the top ten social networking sites. In August 2012 the site was made available to everyone without invitation. There are now 29 million weekly North American visitors and the company is valued at $1.5 billion. So what’s so attractive about a pinboard all of a sudden? Like most social media applications there is nothing revolutionary about the concept but something has absolutely struck a chord. The company says “Our goal is to connect everyone in the world through the ‘things’ they find interesting. We think that a favorite book, toy, or recipe can reveal a common link between two people.” Unlike Facebook which is geared around linking up with people through friends, and Twitter which is about sharing what you are doing or thinking to strangers, Pinterest is about linking people together through things. People say that you can tell a lot about someone by seeing their record collection, bookshelf or wardrobe and Pinterest is building on this. It is also building on the growth of scrapbooking and the standard practice of creatives to collect pieces of inspiration in a book. The applications are interesting and are part of what drives lots of social media usage – they are the way that social media moves from being a passive page to something much more interesting and creative. The examples on the Pinterest home page are of people gathering ideas either for personal inspiration or to crowd source opinion – weddings being organised with input from friends and family, designers gathering inspiration online in a way which previously would have involved a scrapbook. From a B2B perspective the challenge is then whether to and how to use Pinterest in a way which is sympathetic to your business objectives and the Pinterest user community. With anything new the risk is that either companies pitch in because they feel they need to have a presence or conversely shy away because they don’t understand what it does. Retailers have been pioneers in this area – they have latched on to the vibrancy of the platform and the behaviours of younger fashion customers leafing through magazines for inspiration. 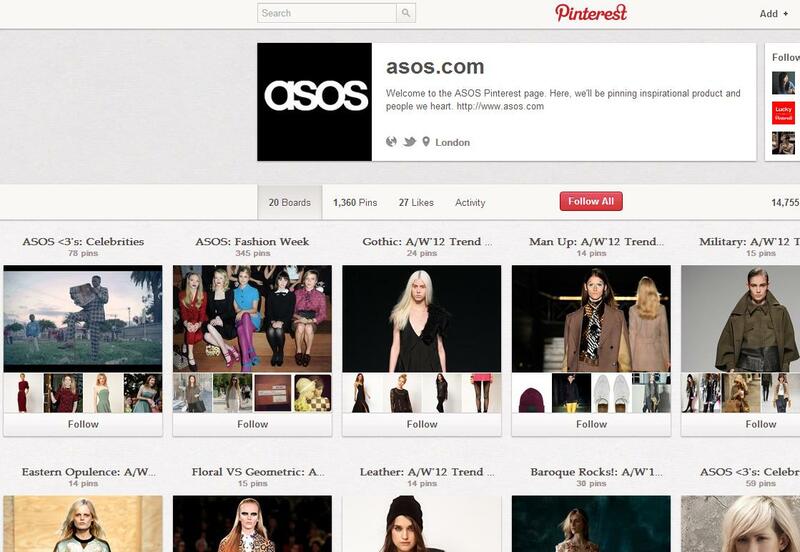 It’s still early days but ASOS are pioneers on many things Social http://pinterest.com/asos/. Does it work in terms of money through the till? It’s too early to say but it does have 14,000 followers. The biggest brand on Pinterest, with almost 300,000 followers is The Perfect Palette. The biggest user is Ez Pudewa, a blogger, with 2.8m! There is an excellent article assessing the power of Pinterest from a marketer’s point of view here http://www.zazzlemedia.co.uk/blog/assessing-pinterest-for-uk-marketers-do-we-really-need-to-care/ by James Carson of Bauer Media.